Jason Sharp has emerged as one of Canada’s most fascinating New Music composers in recent years. 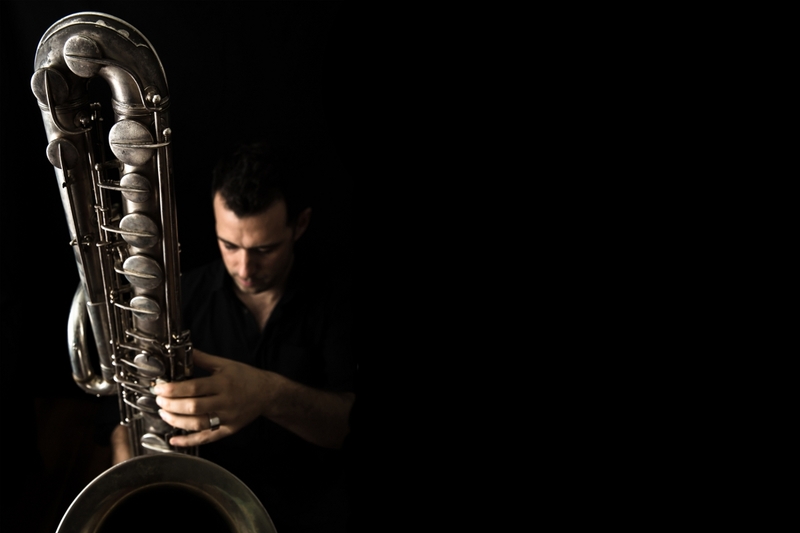 From his roots as a saxophonist in Montréal’s fertile jazz and improv scene, Sharp developed as a soloist with drone-based durational music, circular breathing, and an increasing exploration of the body and technology. His impressive 2016 debut A Boat Upon Its Blood was a molten and musically diverse work of modern composition inspired by a Robert Creeley poem, distinguished by Sharp’s use of a heart monitor and amplified breath to trigger various rhythmic and textural electronic elements – alongside his own saxophone playing and contributions from guest players on violin and lap steel guitar. Stand Above The Streams expands on this approach, with Sharp having further developed his custom Midi and synthesis apparatuses, and most notably collaborating on these compositions with Adam Basanta, whose renowned practice in sound art, sound installation and autonomous sound systems makes for impressively immersive, layered and complex new work. All sound sources on Stand Above The Streams originate with Sharp (with the exception of violin from the album’s co-producer and mixing engineer Jesse Zubot on one song): bass and baritone saxophones, heartbeat, pulse, and breathing are played/processed in real time through Sharp’s own signal-bending synthesis rig and through Basanta’s bespoke ‚controlled feedback‘ amplification system. The album’s rhythms are generated wholly from Sharp’s similarly controlled breathing and heart rate. The results are utterly gripping, with melodic and micro-tonal elements flowing amidst waves of atmospheric pink and brown noise, low-end modulation and calibrated distortion. Through four parts each running in the 10-minute range, Stand Above The Streams conjures an evocative, abstracted survey of organic nature, perhaps from on high, like a satellite scanning and processing data across diverse and slowly changing landscapes. The album also sits very comfortably alongside the recent resurgence in synth-based soundtrack music (John Carpenter, Tangerine Dream et al) – though as alien as it can sometimes sound, there is an unmistakable human element and underlying warmth that courses through the tensile strength of this music, electrifying it with the viscera of the body.